Xuánxuán Qíjīng (玄玄棋經, Gateway to All Marvels, Gengen Gokyo, 현현기경) is a classic, Chinese problem collection published in 1349 by Yan Defu and Yan Tianzhang. 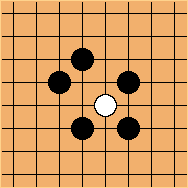 It traditionally consists of 347-problems; and is one of the most influential problem collections in go history. In Japan, it is known as the Gengen Gokyo. Many editions and versions of the book have appeared since its first printing, sometimes varying in number of problems, problem order, solutions, 'revised' problems, and so on. 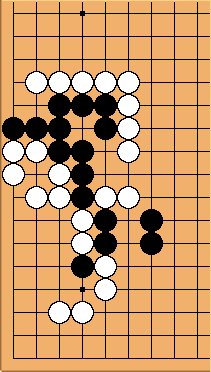 The Xuanxuan Qijing is available on Sensei's Library here. SL's Xuanxuan Qijing Problems - 347-problems with partial solutions. 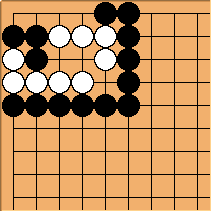 tsumego.tasuki.org - PDF, 347-problems with no solutions. http://u-go.net zip or gz file - SGFs, 347-problems with solutions. 1980 Gengen Gokyo-shu Go Seigen Japanese Heibonsha 4-582-80387-3 & 4-582-80390-3 2 volumes, boxed. Now available as on-demand paperbacks. 89-333-0341-3 Chinese translation of 1979 Hashimoto version. 4-315-51034-3 2 volumes. Digest, only 140 problems. 2012 The Gateway to All Marvels John Fairbairn English Amazon Digital Services / SmartGo Books Collected version from multiple sources. 466-problems and variants with solutions. Historical notes and translations. As noted in an old GoDiscussion thread, Kobayashi Chizu, 5d recommended that everyone should do the Xuanxuan Qijing, giving the opinion that it was the easiest of the classic problem collections. Weaker players can also try for a bit, and then look at the solution -- noticing new motifs. She says that it is a lot about "feeling" & vital points. tchan001: The original 1349 Chinese version is composed of 6 parts 禮, 樂, 射, 御, 書, 數. The version which seems to be based on the ancient Chinese edition is the Xuanxuan Qijing ISBN 7-80511-757-8 from the Chinese Weiqi Ancient Manuals Big Series?. The earliest Japanese version is the Kan'ei (寛永) version (1624-43) but this edition is said to be more complex than the original Chinese edition as if revised. In 1753, Kawakita Meihei? produced a version called "Explanation of the Gengen Gokyou in Proverbs" splitting the Kan'ei version in three sections for three scrolls. The Hashimoto Utaro version seems to be a major re-edit of the Japanese version with selection and explanation by Hashimoto. It is quite different from the original chinese version in the way it is organized.